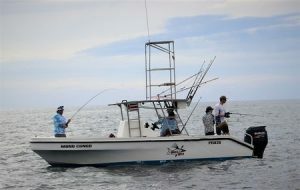 This 25ft Open Fisherman out of Paquera on the tip of the Nicoya Peninsula is powered by a 175HP Suzuki four-stroke outboard. Captain Thomas Jones, a marine biologist with 10 years’ experience fishing the area, and who specializes in inshore fishing, is at the helm. Cruising at 20 knots, she has a live well, outriggers, tuna tower, a marine head inside the console, marine stereo, VHF radio, Garmin sounder and GPS equipment. The boat carries Shimano reels for trolling including Torsas, TLDS and Tyrnos spinning reels, Shimano, Saragosas, Soccoros and Okuma, and Azores 90z. The boat will also pick up/drop off in Puntarenas. Anglers who want to fish on the fly should bring their own equipment.